Discover the various opportunities for Bluetooth phone and music integration into your vehicle. 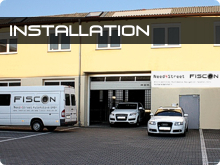 FISCON products are available directly at our shop. With expert advise and comprehensive support. 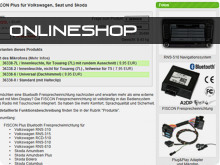 Learn more about installation and operation in our numerous car related manuals. Are you are a reseller and do you want to trade with our products? We provide best reseller conditions. Just another handsfree? No! The FISCON handsfree can do much more. It not only provides full functionality for a comfortable operation of the cellphone, but also integrates them completely into the electronic system of the vehicle. Call lists can be shown on the navigation system or on the FIS display of the tacho unit. You can dial directly using the buttons of the car and leave the cellphone in your pocket or purse. There are a lot of Bluetooth handsfree kits on the market. Compared to them, the functionality of a FISCON handsfree is untouchable. 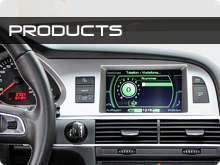 Full integration into the infotainment system of the vehicle, support of more than 1500 different cellphones and audio streaming of MP3 files from the phone to the sound system of the car makes a FISCON handsfree unique! It even out-classes the functionality of an OEM handsfree. Why to use ergonomic worse solutions with external units and small displays? Recommended in the German Car Magazine "Gute Fahrt 11/2008"
Quotation: "No other handsfree is so easy to install and versatile. [...] and one has already a terrific sounding handsfree, which contacts wireless via Bluetooth to cellphones." 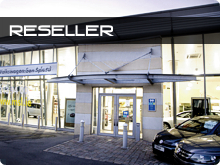 The specialist press is excited upon the performance of a FISCON Bluetooth handsfree. Customers who ordered directly at our shop can use our competent and customer oriented support. Benefit from advice, installation support by telefone or eMail, spare parts supply and update service. We are fluent in German and English language. Our goal is to support you to have an installation without concerns and best experience using our products. FISCON handsfree kits support the phone profiles of nearly all brands and cellphones. In the compatibility list you can confirm that your cellphone is already supported. New phone models can be added with a software upgrade, so your system will keep running evan after you change to a brand new phone. Using the A2DP technology, you can stream music files stored on your cellphone into the infotainment system of the vehicle via Bluetooth. It is controlled with the buttons of the radio or navigation system so you have always your current collection of music available without handling external storage devices. For regularly renewing vehicle fleets, the FISCON handsfree kit is an economical and profitable alternative to a standard installation. Because of the Plug & Play installation, modules can be transferred quickly and easily to new vehicles. Software updates for new telephones and growing vehicle compatability can greatly increase the FISCON handsfree service life. If you want to adapt your FISCON handsfree to another car or if a cable has been damaged, you can buy all single components as spare parts. With a FISCON handsfree you can plan for the long term, even if you plan to change the configuration of car or phone.